Make your crafting wishes come true this winter and enter to win 1 of 3 Bubblegum Pink Sewing Machines from The Pink Pom-Pom Project! It’s our way of giving back to all those fabulous people volunteering to make our projects possible! So a big THANK YOU to YOU! 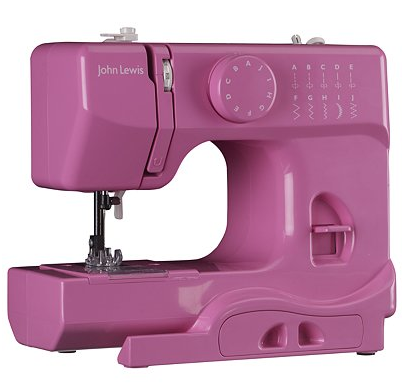 It is a John Lewis Mini Sewing Machine in Bubblegum Pink, a perfect sewing machine for all Beginners. It has enough functions to let you experiment and have fun, but not so many that it’s overwhelming. The features include: 10 stitch options, 2 needle positions, drop-in bobbin, and free arm (great for adjusting cuffs or trousers). It also has a double presser foot and push lever reverse for when you want to reinforce a stitch. It’s suitable for light to medium fabrics, so you can mend and make things as you wish. Worth £60.00, this little baby will surely put you on your way to any catwalk in the world! Just sign-up for the newsletter at www.thepompomproject.com. 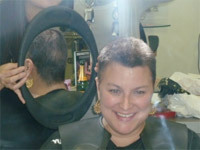 Names will be drawn and WINNERS announced on 1st December 2011! This entry was posted in ALL POSTS, The Big Events, TRENDS FOR CANCER, Wicked Stitches and tagged Crafting for cancer therapy, Sewing Machine Giveaway, The Pink Pom Pom Project. Bookmark the permalink. 1 Response to The Pink Pom-Pom Project’s Pink Sewing Machine Giveaways! Wow this is a must view, bookmarking your site now. Please continue to write, your style is very outside the box.